Marijuana abuse is characterized by the habitual use of marijuana. Marijuana is considered to be both mentally and emotionally addictive. Individuals with a marijuana abuse problem tend to gravitate to others who share their common interest in the drug. They also tend to lose interest in activities that once meant a lot to them such as going out with friends and participating in sports. Marijuana is one of the most widely abused illicit substances known to man. It has been used for everything from curing ailments to being part of religious ceremonies. Present day, marijuana is a Schedule 1 controlled substance, meaning that in its smoked form it has no commonly accepted medical use. Many users of marijuana do not consider that they abuse this drug, but they would not want to stop using it if given the option. Marijuana abuse is just like any other drug abuse problem. The user eventually feels they "need" the drug and find themselves unable to quit using it for fear of withdrawal symptoms. Not everyone who uses marijuana develops a marijuana abuse problem. When an user begins to seek out and take the drug compulsively, that person is said to be dependent on the drug or addicted to it. In 2002, over 280,000 people entering drug treatment programs reported marijuana as their primary drug of abuse, showing they needed help to stop using. Marijuana abuse leads to the user building a tolerance to the drug. "Tolerance" means that the user needs increasingly larger doses of the drug to get the same desired results that he or she previously got from smaller amounts. Regular users of marijuana develop a tolerance to it very quickly. These same users will show signs of withdrawal when they do not use the drug. They develop symptoms such as restlessness, loss of appetite, trouble sleeping, weight loss, and shaky hands. Marijuana abuse researchers have found that THC (the main psychoactive substance found in the cannabis plant) causes changes in the way sensory information gets into and is acted on by the hippocampus. This is a component of the brain's limbic system that is crucial for learning, memory, and the integration of sensory experiences with emotions and motivations. 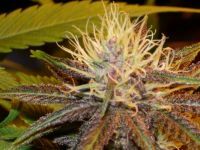 Investigations have shown that neurons in the information processing system of the hippocampus and the activity of the nerve fibers are suppressed by THC. In addition, researchers have discovered that learned behaviors, which depend on the hippocampus, also deteriorate. Recent research findings also indicate that long-term marijuana abuse produces changes in the brain similar to those seen after long-term use of other major drugs of abuse. Marijuana abuse will often cause many of the same respiratory problems that tobacco smokers experience. These individuals may have daily cough and phlegm, symptoms of chronic bronchitis, and more frequent chest colds. Continuing to smoke marijuana can lead to abnormal functioning of lung tissue that is injured or destroyed by marijuana smoke. In early stages of marijuana abuse, almost every person believes that they can end their marijuana use without help. Unfortunately, most attempts at ending marijuana abuse without professional help result in failure. The individual is never able to achieve long-term abstinence. Research has shown that long-term marijuana abuse results in significant changes in the user's brain function that persists long after the individual stops using drugs. These marijuana-induced changes in brain function may have many behavioral consequences including the compulsion to use marijuana despite adverse effects.